Autumn Heights is the second island explored by the Kongs in Donkey Kong Country: Tropical Freeze, unlocked after beating the boss of Lost Mangroves, Pompy. The boss of this world is Skowl. The environment of Autumn Heights is heavily inspired after Swiss landscapes, being a grassy mountain or canyon where pine, birch trees, and various species of shrubs and flowers form the prevalent vegetation. Swiss architecture is also captured in many of the buildings found in early levels, such as windmills, steeples, and chalets. Some levels take place in greeny landscapes, while others are set in red, autumnal forests. The island also features a sawmill where the trees are chopped up and processed, as well as caverns used for cheese storage by sapient mice, the Cheesy Chesters, common enemies in this world. Other common species are Schnautzels, wild boar enemies that puff fireballs out of their snouts. Hootzes and other Snowmad relatives seem to have established a town in the higher summits of Autumn Heights. However, some of the huts specific to this town can also be found near the base of the island, during Mountain Mania. Owl statues and constructions are dedicated to the presence of Hootzes. The highest summit of the island itself depicts the visage of an owl. World 2-1 Windmill Hills A level in which the Kongs are venturing by and through many windmills. World 2-2 Mountain Mania The first level in the game to have Rambi the Rhino available. It also heavily features bell steeples which can be collapsed with Rambi's horn. 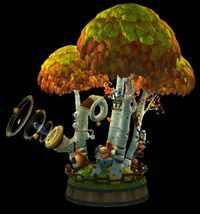 World 2-3 Horn Top Hop A level taking place in a musical forest, filled with birch trees, falling leaf platforms and alphorns played by Hootzes. World 2-4 Sawmill Thrill A level where minecarts and even a sawed log of wood must be ridden through a series of sawmill hazards. World 2-5 Alpine Incline A stage taking place right under and above the clouds, featuring numerous hot-air balloons that can be used as platforms. World 2-6 Wing Ding A level taking place at high altitude, where Hootzes have presumably built a town. It takes the Kongs through a series of Zip-Line Vines. World 2-A Crumble Cavern A damp cavern level with a lot of crumbly material. World 2-B Rodent Ruckus A level that hosts the first Rocket Barrel ride sequence in the game. It takes place inside a cheese mine with a heavy population of Cheesy Chesters. World 2-K Bopopolis The second Hidden Kong Temple stage. It emphasizes on precise jumping and stomping rows of enemies. World 2-Boss Mountaintop Tussle The second boss level in the game. It hosts the fight against Skowl, an enormous owl and the commander of the Hootzes. The following is extra content that can be unlocked in Autumn Heights. The unlockables can be seen in their respective galleries after selecting the "EXTRAS" option. For a full list of extras in the game, see here. Images are unlocked by collecting all Puzzle Pieces in certain levels. Below every image that follows is the name of the level it can be unlocked in. A soundtrack selection for this world can be unlocked after beating Skowl, the Startling. Windmill Hills - Plays in Windmill Hills. Sawmill Thrill - Plays in Sawmill Thrill. Alpine Incline - Plays in Alpine Incline. Rodent Ruckus - Plays in Rodent Ruckus. This page was last edited on September 3, 2018, at 17:26.